Title: Red Barn. 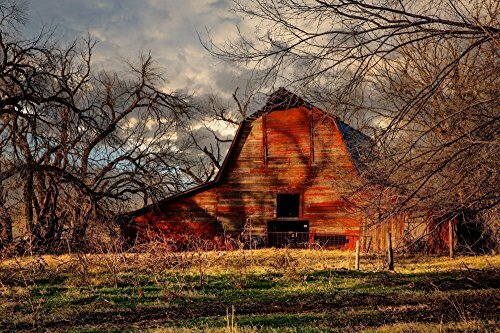 An old red barn sits in the shadows of leafless trees on a late autumn day in Oklahoma. Most prints shipping to U.S. locations will ship within two business days. Image also available as in canvas or metal. See storefront for listings. More of my work can be found by clicking my store name below my profile picture. If you have any questions about this product by Southern Plains Photography, contact us by completing and submitting the form below. If you are looking for a specif part number, please include it with your message. Vintage Football Gear on Vintage Background Fine Art Photography Print, Sports Decor, Football Nursery decor, Vintage Sports Nursery Art, Football artwork, Kids Room Wall Art.